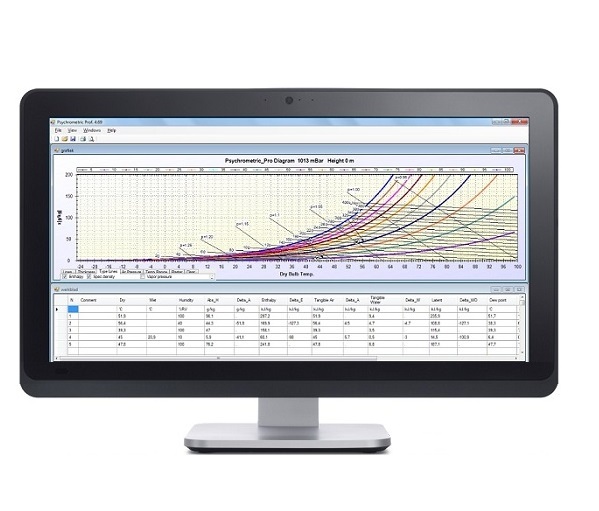 The psychrometric chart or Carrier chart is made easy to use by Tadema HVAC software. With Psychrometric chart Pro you can make calculations of air treatment processes such as cooling, heating and humidifying. Psychrometric chart Pro is available on Windows and Android. The psychrometric chart is also known as the Carrier diagram or enthalpy pressure diagram. The chart is limited by the line where air is completely saturated with water. Whenever the edge of the psychrometric chart is reached the relative humidity is 100%. The psychrometric chart is a visual representation of 3 components: At first, enthalpy H, as illustrated in "Heat-content". In a psychrometric chart enthalpy is shown in h(kJ / kg). At second, the humidity is illustrated as the moisture content x [g / kg]. At last, temperature is on the bottom axis of the psychrometric chart.